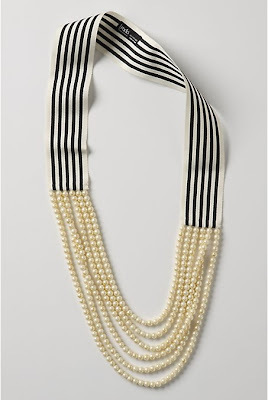 I saw this necklace at Anthropologie last May and absolutely fell in love but could not afford the $200 price tag. So today I am going to attempt to recreate this darling nautical piece with $10 worth of pearl beads, navy striped grosgrain ribbon and string from JoAnnes!! I'll letcha know how it goes, I think the last time I beaded necklaces I was in 2nd grade haha.